Creativity is contagious and we're passing it on. 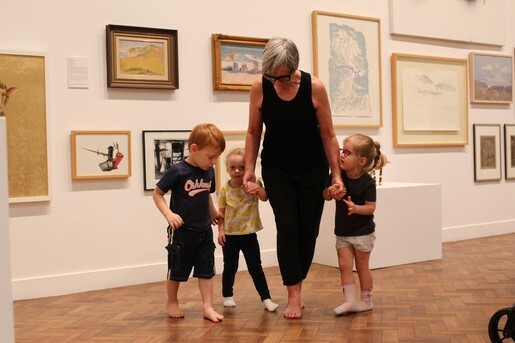 The Gallery offers a comprehensive and imaginative program for early childhood, primary and secondary schools, tertiary education students and adults. We're here for everyone. The education and outreach program covers all art forms and ages. The education program brings a host of programs for children and adults that can be accessed for free and support learning, access and creative play. We host programs in the Gallery amongst the exhibitions but we also have a workshop. The workshop is right next to the Gallery and encourages mess, experimentation and play. Our Education program is led by Sally ONeill, Education Officer. More involved or multi sessional classes will attract booking and payments, so check the events listing for what we have scheduled for today. Our Outreach program sees an Janet Gordon, Outreach Officer out on the road everyday, visiting outlying schools and providing a creative learning session each morning. Current locations are Dalton, Goulburn East, Tallong, Breadalbane, Taralga, Windellama and Marulan, always free. Art Teenies is a free, weekly event for under 5's and their carers held Monday at 10am. Teenies are guided through the current exhibition along with a fun, creative activity. Each week the activity will vary with story telling, music and movement forming part of the hour. Art Teenies is a great way to introduce smaller children to contemporary art and brings parents and carers together in starting the week right. A yoga program is peppered throughout the program to add a little ommmm to your Monday. This program is led by Sally O'Neill, Education Officer, who has tertiary qualifications in early childhood. Wednesday, Thursday and Friday afternoons means Afternoon Art Club takes over the Gallery. Run throughout each school term, the Clubs caters for primary and high school students, giving them a chance to express their creativity and explore a range of art making. The Clubs are designed to introduce participants to many forms of practice and to develop these new skills and techniques. Participants are inducted each term with a set of guidelines to ensure each child feels welcome, safe and encouraged. Clubs are safe spaces to have fun and be expressive, and are supervised by Sally O'Neill, Education Officer. We celebrate with an end of year party in Term 4 and host an exhibition of the high school works. Its a heap of fun and we really love hearing the Gallery full of young people enjoying themselves. 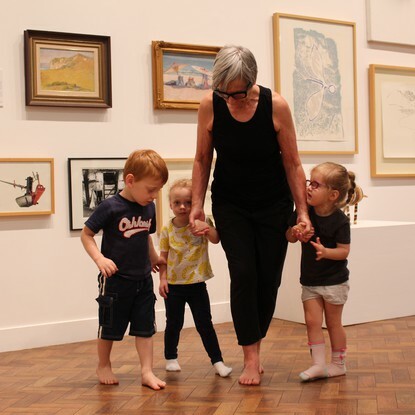 Each member of the Gallery that works with children holds a Working with Children Check. We provide free, guided tours for school groups of any age. Each tour is created especially for your class and includes a general discussion on the current exhibition and delves in to particularly interesting parts of the practice or works we are presenting at that time. Tours are a great way to familiarise school children with the Gallery and contemporary art, and builds ther confidence in discussing ideas and techniques. Tours can include a practical activity and be tailored for you as you need. Buses are encouraged to park on Church Street. See the School Programs page for more information. Yes, we can visit your school! If you struggle to access the Gallery or get here regularly, let us know and we can arrange a visit. We regularly provide transport for schools that are just that little bit far away so please contact us if we can help. The Gallery regularly runs classes and workshops for adults. Recent classes include experimental drawing, life drawing, ceramics and photography. Classes range from led and technique based to looser guided sessions. These events are a great way to meet new people and connect with your creative self. See the events page for listings.